Yesterday the weather was pretty great. A clear and sunny -3° C without any wind. The perfect weather to have a walk then, and create some of that vitamin D.
This is actually a very good picture of how I personally prefer my jackets to fit. A slim and complimenting silhuette without the jacket being too tight or looking too small, and more than anything a nice round and soft shoulder line that simply looks great. Anyway, the worn items include my dark green L.B.M. 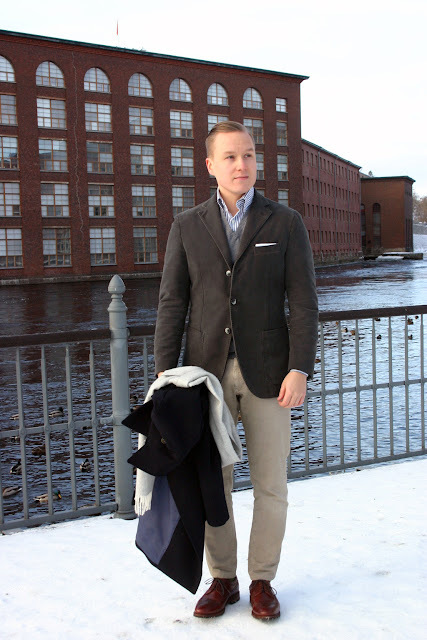 1911 moleskin jacket, a button-down SuitSupply shirt, a grey V-neck cotton vest, Incotex Red casual chinos, Equus Leather bridle leather belt and Meermin longwings. To stay warm, as almost every time I wear any kind of odd jacket, my peacoat.